Caorle goes back to the first millennium BC., along with the first settlements in the Venice lagoon. 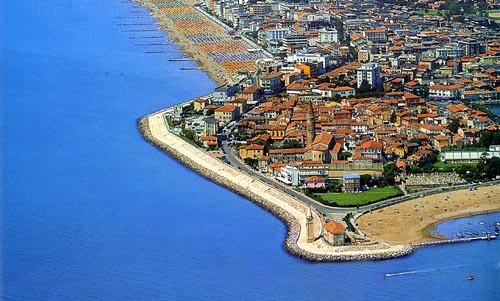 Caorle continued its history into the Roman era as a natural port for supplying nearby Julia Concordia. 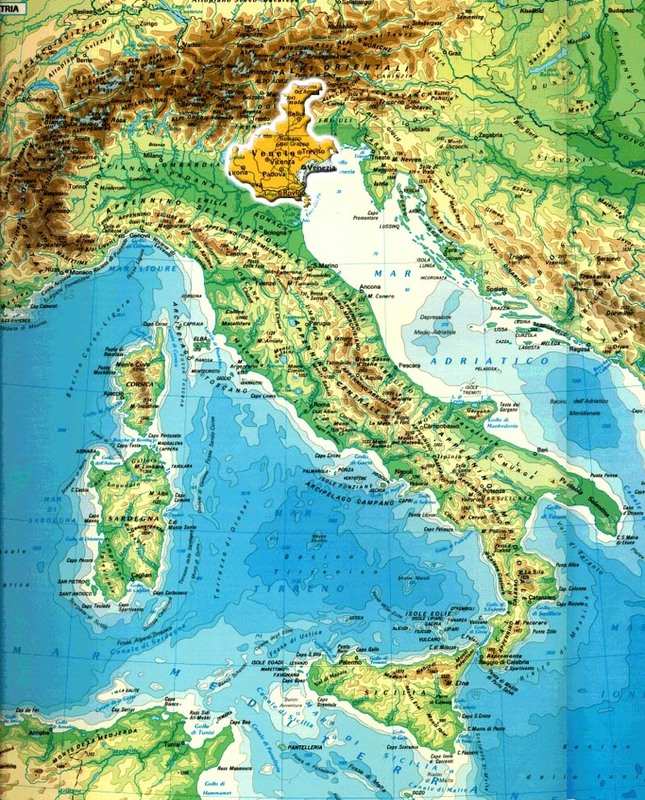 The depredations of Attila the Hun in Italy dorve the peoples of Venetia and Friuli to take refuge in these lidos and the town wa probably founded in 452 AD. Today, Caorle offers the visitor an attractive picture, both when viewed from the land and from the sea. Its cylindrical 12th Century bell tower and the extremely old Romanesque Cathedral can be seen nestling against the delightful cliff top whilst the large old fishermen's town that runs along it offers houses in lively pastel shades, "calli" or Venetian alleys and sunny "campielli" or little squares. These attractions are unique to this area and have made the Venetian coastline renowned worldwide. The coast of Caorle, Porto S. Margherita and Duna Verde has 15 km of beach that slopes gently down to the sea blending sea and sand into a single yellow-azure line that perfectly caters for all the holiday maker's needs. Here we find sunbeds and sunshades, cabins and showers, first aid stations and restaurants as well as hotels and boarding houses of all the different rating, camping sites, holiday villages an self catering accommodation. There are also shopping centres and "botteghe" or traditional shops, fashionable boutiques and elegant icecream parlours, typical restaurants, pizzerias, discos and sea terraces. 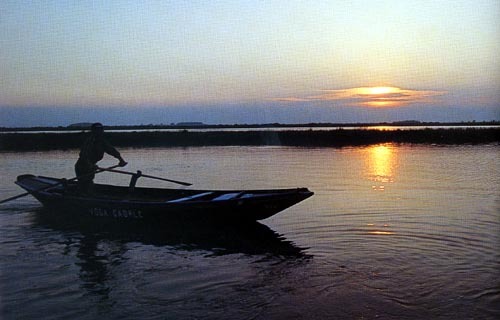 The lagoon and the valleys are Caorle's great wealth, offering thousands of acres of reed beds and calm stretches of water where nature has remained unspoilt. Here and there, are to be found the "casoni", the old reed houses of the fishermen of the lagoon, which are unique historical and architectural records. It is not easy to describe a natural scene in which the only sound is that of the oars or the birds in flight, but this is what Ernest Hemingway did in some of the finest pages of this book"Beyond the river between the trees". At Caorle, history and tradition meet and reconvene moments from the past. The locals savour their relationship with their cultural heritage because this legacy is reflected in their everyday life and has moulded their character and the way they live. The great Caorlina festival, the "bragozzi" regattas (Venetian two masted fishing boats). Caorlevivistoria (Caorle's history come alive) and the Fraima festival are events that evoke a past that its inhabitants think back on fondly and which they bring back to life with splendid historical costumes and folklore. 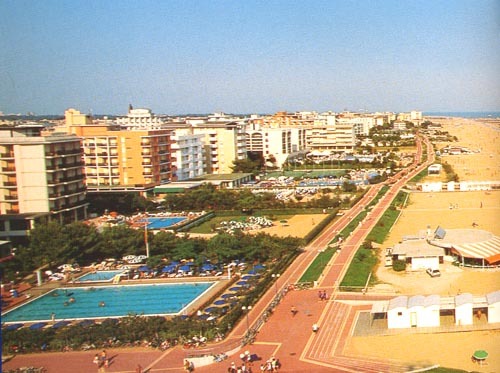 Bibione is located in a vast pinewood and has a beach of unparalleled proportions. Bibion developed as holiday resort in the sixities, although archaeological discoveries show that there was already a settlement here in Roman times. Bibione "Tuttaspiaggia" (measureless beaches) has won a name for itself thanks to the lienght and wdth of tis dandy shores on which the sun shines from dawn the dusk. The beaches are full of orderly, colourful rows of sun shades. It offers safe cycle routes, a splendid sea front and a variety of sporting facilities that make it the ideal place for different activities. Its new and highly modern "Bibione Thermae" spa (recognized by the Italian National Health Service) exploits the alkaline bicarbonate-sodiumfluorate waters that gush out at 52¡ C and offers mud treatment, bathing therapy, inhalation therapy, and physiokinesis therapy; there is also a well equipped gymnasiums as well as a spa park overlooking the sea with covered thermal and open air swimming pools. The Caorle and Bibione's sorroundings offer a good number of different kind of itineraries: Historical-Artistic-Architectural itineraries which include Portogruaro, Villanova, Fratta, Teglio Veneto, Summaga, Fossalta. 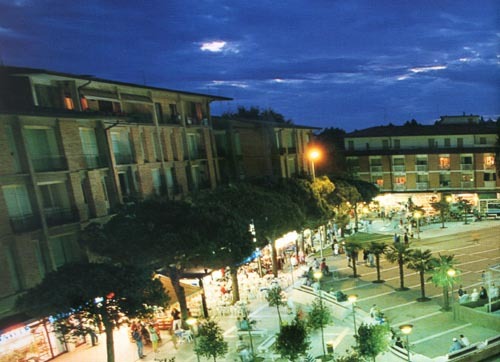 Portogruaro is the capital of eastern Venetia and is located halfway between Venice and Trieste. This partly Medieval and partly Renaissance town has the river Lemene running through it, which at every turn offers incredibly beautiful views. The heart of the city is Piazza della Repubblica, to which the Town Hall forms a backdrop. This is considered to be the finest Medieval building in Portogruaro, the oldest part of which dates back to the fourteenth century. Some of the building overlooking the two main streets have have porticoes and are magnificient examples of Italian and Venetian Gothic style from the 14th and 15th centuries. At Portogruaro there is the interesting Museo Nazionale Concordiense . It contains many exhibits, which come from the neighbouring Concordia Saggittaria. The Renaissance Villa Marzotto that belongs to the town council is also worth a visit: it boasts a nice park and it houses the M. Gortani Paleontological Museum. Concordia, situated about 3 km south of Portogruaro, was a Roman settlement and boasts a nice Archeological museum and a nice ancient cathedral with its Byzantine baptistery. The area around these historical towns is rich in natural itineraries that will show you the typical cultivation, parks, woods and lake and in vineyards and the D.O.C.Wine-producers (Controlled Denomination of Origin).